Cold Hudson to premiere on PBS Thanksgiving Day! 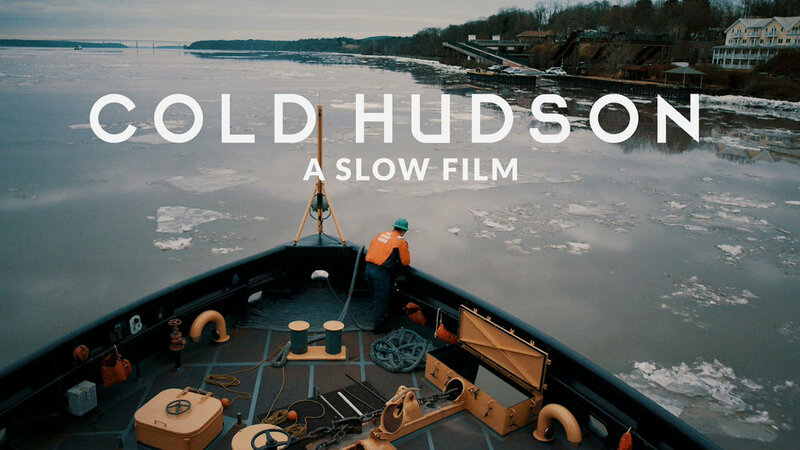 COLD HUDSON is a 7 hour slow film premiering at 12pm on WLIW21 on November 23, 2017, Thanksgiving day. COLD HUDSON follows the US Coast Guard Cutter Sturgeon Bay on a 7 hour journey up the Hudson River, starting at West Point, travelling north on the river to Catskill, then back south to Rhinecliff, NY. The film is shot from the perspective of the captain and crew on the bow, and one static shot shows the real time progression of the ship as it cuts through cold waters. The USCGC Sturgeon Bay, a 140-foot Bay Class Cutter stationed at Governors Island, is used for breaking ice and rescuing ships caught in the frozen landscape that forms on the river each winter. We will be in Miami starting tomorrow! Saturday the 20th, Billy is hosting a workshop: Sound for the New Media Frontier. This event is especially exciting because in addition to talking to participants about sound in interactive media projects, participants will contribute to an interactive exhibit that will be unveiled later in the week. (DIS)LOCATE will be part of the interactive installations at the FILMGATE Interactive Conference taking place at the Deauville Beach Resort February 26-28. This observational, interactive exhibit explores our relationship with media and challenges how we consume content in a group setting. It is a collaboration between participants of the Sound for the New Media Frontier workshop and creative technologists. During the festival, filmmakers will explore Miami from a slow and aural perspective. This exhibit stitches together their films in a room designed for relaxation, conversation and creative production. The complete project team for (DIS)LOCATE is Emily Ferrier, Billy Wirasnik, Joey Pitzo (Dev), Jeff Soyk (UI/UX). Art direction and building from Karmel Sabri and Gabriel Tillet. You can purchase tickets for the workshop on Eventbrite. RSVP on Facebook to let us know you'll be there! Over the next month #everydayslo will feature a series of short vignettes and perspective shifting experiments with slow imagery by our good friend Matt Relstab. I love Matt's work for the way that it showcases that slow media and slow filmmaking does not always need to be documentary or 'real' in nature. It can be surreal, it can be beautiful and it can reveal something unique to each viewer when watching one place or one thing change slowly over time. The train station, the sidewalk by your house, your coffee shop; Although you’ve walked through these places day after day, how familiar are you with them? Could you recognize these places in a different light, from a different angle, at a different time? This series takes familiar locations and presents them in abstract and disorienting ways by changing the perspective in which the audience views them. It calls attention to common surroundings instead of mindlessly passing through them. Matt Relstab is a Media Producer based in Boston, MA specializing in photography, sound and lighting. His passion is organizing engaging images and sounds. He makes music with Let's Wait and mostly silly shorts with Pica Films - I recommend checking them both out! Everyday Slo is a series of patient moving images from featured visual artists, filmmakers, and photographers that tell the story of a specific place in time. To contribute, submit your ideas here. One of the goals of Slo.Media is to educate people, Americans in particular, about the ideas, concepts and potential for slow media in our culture and on our screens. While the Norwegians are pioneers in the space of slow tv, there are many other ways for media, all forms of media, to slow down. To that end, we asked out first artist contributor, Elaine McMillion Sheldon what she learned, if anything, about what slowness in media looks like. Sheldon used #everydayslo to follow the people she met while filming a larger documentary piece almost three years ago. She went back through her footage to find moments that did not find their way into her documentary, HOLLOW, but that were part of the story. Over 20 days, we met many residents of McDowell County, West Virginia as they lived the summer of 2012. In telling us about them, she let us in on some of the more personal aspects of producing an intimate storytelling piece like HOLLOW. Elaine is currently in West Virginia, and has a borderline unhealthy obsession with fog. Typically, she'll film for 20 or 30 seconds, but two weeks ago when she saw fog rising in the mountains, she decided to let the camera roll for six minutes. That decision was a direct result of her experience working with the slow platform. To find out more about Elaine, check out her personal blog, or follow her on Twitter and Instagram. Elaine's current project is She Does Podcast. We think it's wonderful, and you should subscribe on iTunes, Stitcher, or your podcast medium of choice. Beginning today through the end of the month, Slo.Media will be featuring the Peabody award winning West Virginian filmmaker Elaine McMillion Sheldon, who will take us on a journey to the most southern part of her home state, McDowell County. This county was the setting for her breakthrough interactive documentary ‘Hollow’, which examined the future of rural America through the eyes and voices of Appalachians. In her run on Everyday Slo she’ll reveal a more personal look at her stay in McDowell County in 2012 while filming Hollow. Follow us on Instagram to watch this slow story unfold. McDowell County, West Virginia is the most southern county in my homestate. It’s the county that makes headlines for being drug-ridden, poverty-striken and one of the least educated corners of our nation. And while there are truths to all of these statistics, I know McDowell County for its people, not its issues. It’s a place where I spent the summer of 2012 filming #hollowdocumentary. But it’s also a place that hasn’t taken its grips off of me since we first met. McDowell County was once prosperous. 100,000 people called it home. The coal mines employeed thousands, including African Americans from the South, and Eastern Europeans who made their way into the rugged mountains from Ellis Island. But today all that has changed. Today, only 20,000 people remain. Schools have consolidated. Businesses and churches have become empty shells. But nevertheless, there are those who have stayed. During my summer there, I worked with the residents to create a participatory documentary that highlighted their viewpoints about the decline. I would be naive to say that my own opinions and beliefs aren’t scattered throughout. To immerse yourself in her mind, her work, and the complicated, interesting, inspiring, confusing, beautiful McDowell County, check out the award winning HOLLOW Documentary. Elaine's current project is She Does Podcast. We think it's wonderful (full disclosure: we also work on it), and you should subscribe on iTunes, Stitcher, or your podcast medium of choice. Elaine is also a producer for Slo.Media's larger production and outreach efforts. Connect with bio over here.